Bella Hadid in London. Image via Twitter. 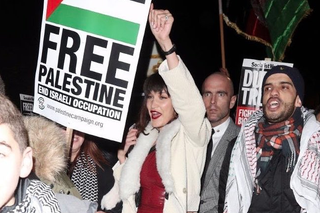 On Thursday, supermodel Bella Hadid, who is of Palestinian descent, posted an emotional protest on Instagram against Trump’s decision to recognize Jerusalem as the capital of Israel, undermining the multi-faith sanctity of the territory and furthering the oppression of the Palestinian people. Last night she and her bodyguard (Nosferatu) burst into an anti-Trump protest outside the American Embassy in London. Yes, it was in an evening gown on her way back from a Tag Heuer promotion, but hey, at least somebody from the Victoria’s Secret stable got out of a limo to pump a fist. At first the image is uplifting (and her bodyguard, mesmerizing), but typing that last sentence feels pretty depressing after watching the wreckage caused by Trump’s carelessness this weekend. The protests were part of a worldwide “day of rage,” with violent clashes on the West Bank, East Jerusalem and the Gaza Strip. It was made clear this week that Trump does not fully understand what he has done, but in the resulting upheaval, people are dying. Al Jazeera reports that at least two Palestinians were killed and 800 people were injured in Friday’s protests in the West Bank, East Jerusalem and the Gaza Strip. Two Hamas gunmen were killed Saturday, as Israel responded to rocket fire with air strikes on the Gaza strip.